To minimise potential bias we used the directed acyclical graph approach to identify a suitable multivariable model. The model included age, total energy and vitamin D intake, body mass index, height (all continuous), educational level (≤9, 10-12, >12 years, other), living alone (yes or no), use of supplements containing calcium (yes or no), a healthy dietary pattern (fifths), physical activity (five categories), smoking status (never, former, current), and score on the Charlson comorbidity index (continuous, 1-16).27 28 A healthy dietary pattern was defined by using a validated method.32 33 Briefly, we used factor analysis to derive the dietary pattern empirically. Factor analysis reduces dietary data to a few composite factors (one being a healthy dietary pattern) that describe the eating pattern in the population. Other potential covariates (such as menopausal status; hormone replacement therapy; intakes of total fat, retinol, alcohol, potassium, phosphorous, and protein; nulliparity; and previous fracture of any type) in the multivariable models only marginally changed the relations and were therefore not included in the models. We treated covariates as cumulative averages.28 The Markov chain Monte Carlo multiple imputation method was used to impute covariates not assessed in the baseline questionnaire in 1987-90 (for example, smoking habits and physical activity). Restriction to non-missing data did not alter our interpretation of the results (data not shown). Moreover, in an attempt to examine whether calcium supplement use modified the association between dietary calcium intake and mortality, we performed stratified analysis by calcium supplement use (no use, use of any type of calcium containing supplements, and specific use of calcium tablets). Additionally, we estimated the synergy index between dietary calcium intake and calcium tablet use.34 We performed sensitivity analysis, limiting the analysis to baseline data using ordinary Cox’s regression without time updated information. In an attempt to validate the robustness of the Cox’s regression model using information updated over time, we used marginal structural modelling.35 The categorical exposure in the marginal structural models was treated as described previously.36 We calculated an additional inverse probability weight for having time varying data, and we gave a weight of zero to those without time varying data. During a median of 19 years of follow-up and 1 094 880 person years at risk, 11 944 women (17%) died; of these women, the underlying cause of death was cardiovascular disease in 3862, ischaemic heart disease in 1932, and stroke in 1100. The highest rates of death from all causes, cardiovascular disease, and ischaemic heart disease but not stroke were observed among those with a dietary calcium intake higher than 1400 mg/day (table 2⇓). These intakes, compared with dietary intakes between 600 and 1000 mg/day, conferred hazard ratios of 1.40 (95% confidence interval 1.17 to 1.67) for all cause mortality, 1.49 (1.09 to 2.02) for cardiovascular disease mortality, and 2.14 (1.48 to 3.09) for ischaemic heart disease mortality. After multivariable adjustment, a high total calcium intake was also associated with a higher mortality risk (table 2). The shift from a lower to a higher risk with the multivariable model was mainly the consequence of the adjustment for use of calcium containing supplements (see supplementary table 1). In addition, mortality rates were higher among women with an intake below 600 mg/day (table 2). 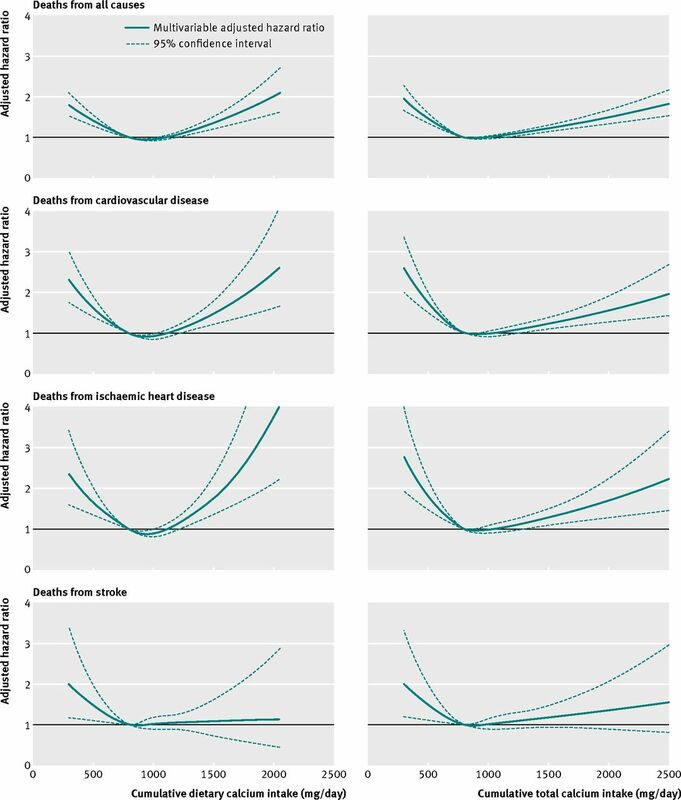 The tendency of a U-shaped association between both dietary and total calcium intake with deaths from all causes, cardiovascular disease, and ischaemic heart disease is also visualised by the pattern of the spline curves in figure 2⇓, a pattern that was not apparent for stroke mortality. However, to deal further with possible bias introduced by using time updated information in the models, sensitivity analyses were carried out. 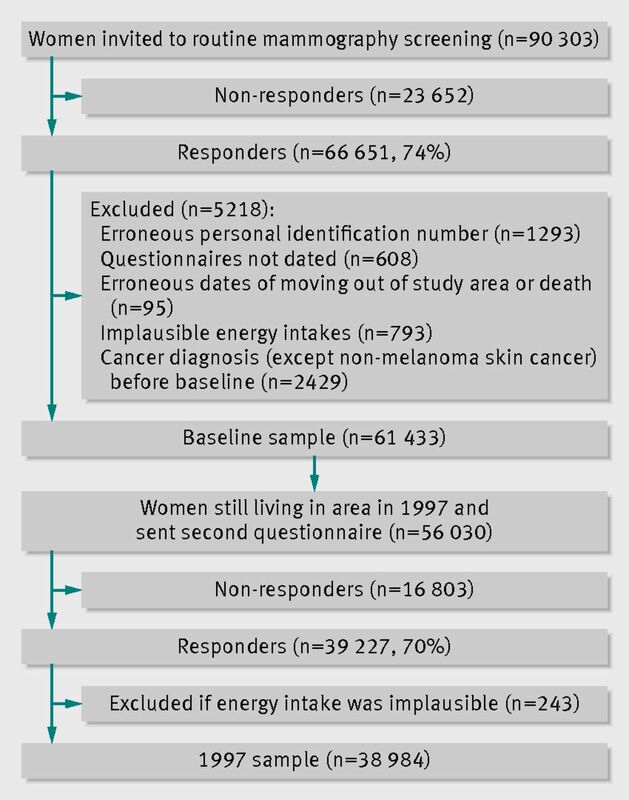 Firstly, only baseline data were included, without updating with information from the second questionnaire (see supplementary table 2). This analysis indicated a higher risk of death with high dietary calcium intakes but not with low intakes. Secondly, a causal inference analytical model was used. Although hampered by a lower precision (see supplementary table 3), the results for the high dietary calcium intake level are essentially similar to those obtained by ordinary Cox’s regression analysis (table 2 and supplementary table 2) but the estimates for women with low dietary calcium intakes were attenuated. Moreover, mortality estimates for women with both low and high total calcium intakes were attenuated compared with the time dependent Cox regression model. Calcium containing supplements were used by one fourth (10 055/38 984) of the study population in 1997. The largest source of supplemented calcium was from multivitamins with minerals (120 mg per tablet; 74% of supplement users). Most women taking calcium tablets were also regular users of multivitamins. The average dietary intake of calcium was similar in calcium supplement users, both at baseline (users reported 6 mg lower dietary calcium intake; 95% confidence interval −2 to 13 mg) and at the second investigation in 1997 (users reported 6 mg lower intake; 0 to 13 mg). Use of calcium containing supplements in 1997 was not associated with death from cardiovascular disease or ischaemic heart disease (see supplementary table 4). Women who had a high dietary intake of calcium exceeding 1400 mg/day and additionally used calcium supplements had a higher mortality rate than women with a similarly high intake of calcium but without taking supplements (table 3⇓). Thus, among calcium tablet users (500 mg calcium per tablet), a high dietary calcium intake (>1400 mg/day) conferred a multivariable adjusted hazard ratio of 2.57 (95% confidence interval 1.19 to 5.55) for all cause mortality compared with a dietary calcium intake of between 600 and 999 mg/day. The same comparison among women with use of any type of calcium containing supplement, yielded a multivariable adjusted hazard ratio of 1.51 (0.91 to 2.50), whereas the hazard ratio among non-users of calcium containing supplements was 1.17 (0.97 to 1.41). Thus, among women with a high dietary intake of calcium, the addition of calcium supplements increased the risk of death in a dose dependent fashion. The synergy index for the interaction between a high dietary calcium intake and calcium tablet use was 4.87 (95% confidence interval 1.11 to 21.32). Calcium intake in adulthood and all cause mortality in women has not been previously investigated. In an analysis including 387 deaths within the Iowa Women’s Health Study cohort15 a total calcium intake below 700 mg/day but not above 1400 mg/day was associated with higher mortality from ischaemic heart disease. Furthermore, a recent reanalysis of the same cohort showed that use of calcium supplements was inversely related to the total and cardiovascular mortality rate, although the benefit was lost at the highest doses of dietary calcium intake.49 In contrast, use of calcium supplements in a Finnish cohort increased the risk of cardiovascular disease.50 Intriguingly, three reanalyses of randomised trials have consistently shown a higher rate of both myocardial infarction and stroke by 25% to 30% and by 15% to 20%, respectively, with calcium supplementation.8 9 10 These results were not confirmed in a reanalysis of another randomised trial using a broad composite endpoint of different cardiovascular events.11 Interestingly, the higher risk of cardiovascular events with calcium supplements in a meta-analysis8 was only observed in women with a dietary calcium intake higher than 800 mg/day and not in women with lower intake levels.